February is a month dedicated to all of our United States Presidents. View photos, displays, and information about the Presidents, their wives, families (even pets), and their Vice Presidents. 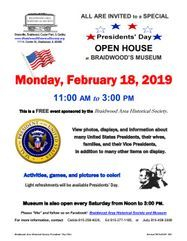 A special Open House will be held on Presidents' Day from 11:00 AM - 3:00 PM with activities, games, and pictures to color. Light refreshments will also be provided. Items will be on display through March 16th. SHARE THE EVENT with friends & family.